When your prospective candidates are searching for a job, they’re leveraging more resources than ever before to help decipher whether your organization is the right fit. From reading employee reviews to checking out your career site, job seekers are doing their research. If you can't answer, "Why should candidates work for you?" then candidates will choose to work for someone else. Attracting the right candidates with your employment story begins with understanding how you compete for talent in unique and compelling ways. 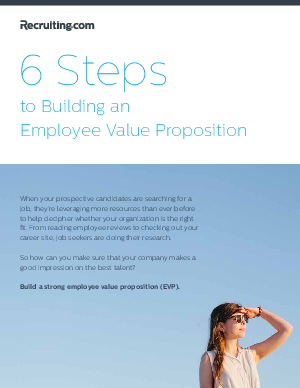 Read this white paper to learn how to build and share an employee value proposition (EVP) in 6 steps.